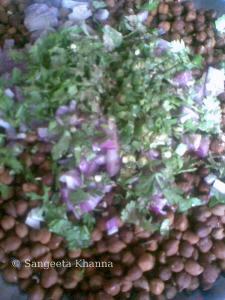 this is a quick and nutritious salad which is good as a breakfast as well as a luchbox option............if boiled chickpeas are stored in the fridge, it can be anytime snack option too...........the best part is , it can be diversified according to mood, availability of ingredients , and time of the day etc. let it cool a bit and mix with all the other ingredients and serve warm or at room temperature. cubed boiled potatoes can be added especially for kids. fried potato chips are also good as they add a crunch to it. haldiram bhujia is great too, arvind likes it this way. 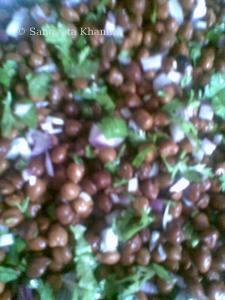 for diabetics healthy breakfast healthy meals healthy snacks lentil/sprouts salads salads these foods helped me loose wt.